His role in ending the 52-year conflict with the leftist rebel group, the Revolutionary Armed Forces of Colombia (FARC), was characterized by direct military engagement and negotiations that began in secret. As Defence Minister in early 2008, Santos ordered his forces across the border into Ecuador, where they killed FARC leader Raul Reyes in a bombing raid. Months later, Santos again sent his military into action to rescue the kidnapped politician Ingrid Betancourt. She had been held hostage by FARC for six years. Santos released dramatic video of the helicopter rescue deep in the Colombian jungle. As the nation celebrated, his reputation as an astute political figure was rapidly being secured. Two years later, in 2010, Santos ran for the presidency and won by a landslide victory. His share of the vote was among the largest majorities in Colombian electoral history. By 2012, under the new president's leadership, the fight against FARC was taking on a different aspect. In the jungles, the military engagements continued, but in the diplomatic shadows the Colombian government was involved in secret talks with FARC leaders. Santos stood for a second term of office in 2014. This time he put a peace deal with FARC at the centre of his manifesto. Amid deepening political hostility with his former allies, Santos won a second term after a run-off vote. With added vigour, Santos pursed his ambition to end five decades of war that had killed more than 250,000 people. 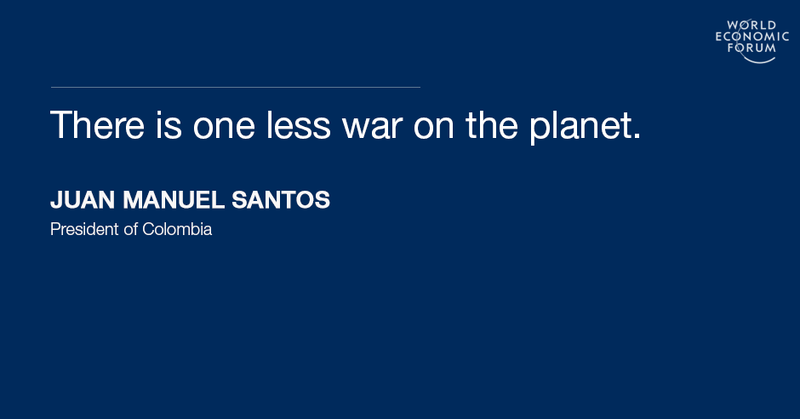 In June this year, as a deal neared, Santos spoke about his efforts to bring peace at the World Economic Forum in Latin America, which was being held in the Colombian city of Medellin. He told the Forum that his strategy of an unrelenting military campaign had eventually convinced FARC leaders that a negotiated settlement, and a transition from war to a political process, was the only way out of the conflict. After six years of negotiations, Juan Manuel Santos delivered on his promise to end the war. On 25 August 2016 he stood on the steps of Colombia’s congress and told his country: "The armed conflict with the FARC is ending.” With those words, the president declared an end to military action against the rebels. The peace process suffered a setback on 2 October when, in a shocking development, the people of Colombia rejected the peace agreement in a referendum. Santos and the FARC leadership have both restated their commitment to ending the war permanently.